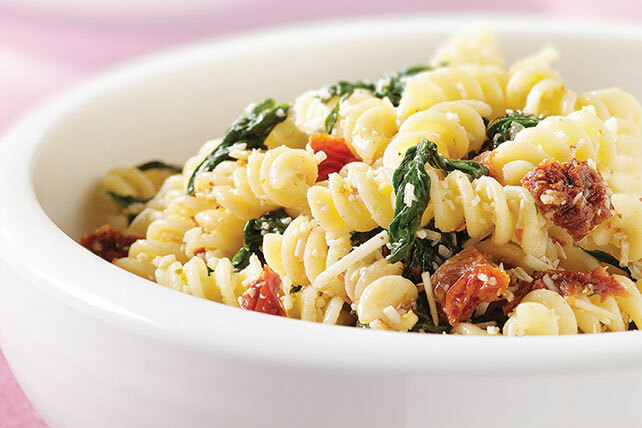 Sun-dried tomatoes, fresh spinach, garlic and Asiago cheese are tossed with fusilli pasta in this 20-minute main dish. Cook pasta in large saucepan as directed on package, omitting salt and adding tomatoes and spinach to the boiling water for the last minute; drain. Place pasta mixture in large bowl. Add reserved oil and remaining ingredients; mix lightly. Serve this pasta main dish with a crisp, mixed green salad or cooked lean meat, poultry or fish. Substitute 1 pkg. (10 oz.) frozen chopped spinach, thawed and drained, for the torn fresh spinach.